Compare and find the best mortgage for first time home buyers in no time! Are you a first time home buyer raving to get an affordable and flexible mortgage with good repayment options? We will provide you with the best mortgage for first time home buyer. We have an extensive lender base. Submit an online pre-approval application. At least 5% of the purchase price of your home plus high-ratio mortgage insurance. But, if you want to qualify for conventional mortgage and you don’t want to pay mortgage insurance, it is best to put down 20 percent of the home’s purchase price. This also assumes that you have excellent credit. The higher the down payment, the lesser is the amount you have to borrow and the lower is your monthly mortgage payment. What is the required down payment if my credit is bad? If credit is bad or challenged, you will need 20% down. Sometimes we can find a mortgage solution with only 15% down if the home is in a major city. There is no special mortgage solution specifically tailored to a first time buyer. A first time buyer would get the same mortgage any other repeat home buyer would receive. However as a first time buyer there could be land transfer tax advantage. Check with your lawyer if this may apply to you. What is the most important step for a first time buyer? As a first time buyer, you will need to be pre qualied and pre approved. Pre qualified is to find out how much of a house you can afford to buy given your income and debt load. Pre approval is the next step. It involves ensuring the credit is satisfactory, as well as income. The pre approval is a written commitment from the lender stating the conditions the approval is based on. 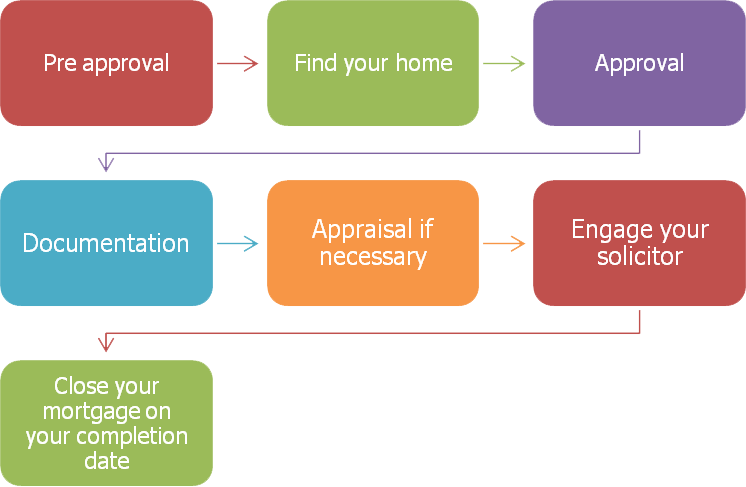 With a pre approval you can confidently make your offer to purchase on your dream home. We give you unbiased and expert advice to identify the best available options and deals that are best suited to your needs. Here’s a simple illustration on how you can secure a mortgage. For more information on our first time home buyer’s mortgage solutions, call us today 1-877 237-2601 or fill out our online contact form.